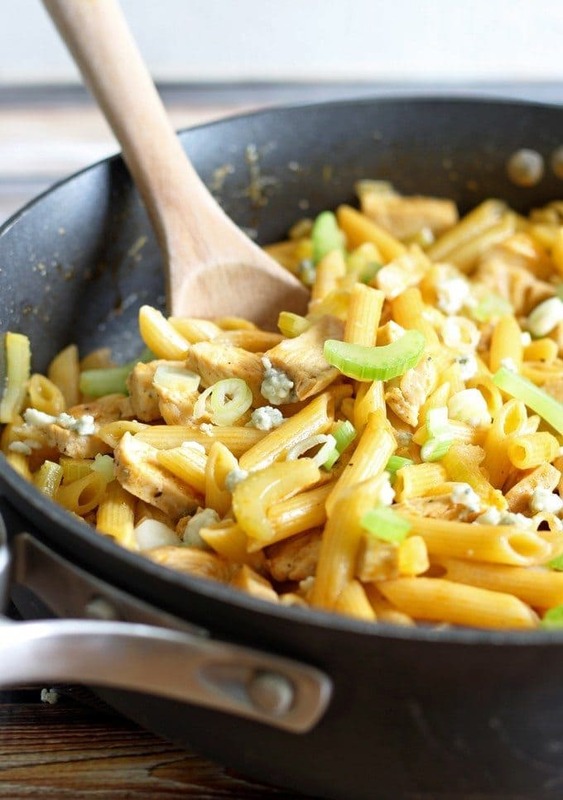 This easy one pot buffalo chicken pasta recipe is perfect for dinner! You can use leftover chicken or cook it fresh and have dinner on the table in 30 minutes. The last week I have been MIA. No new recipes and barely any Facebook, Twitter or Instagram posts. Thank goodness I scheduled a few of those shares ahead of time, or I may have looked like I disappeared. No worries – I’m not taking any kind of blogging break or long hiatus. My poor pup Nero had to have knee surgery on Friday. He limped and limped around for weeks and eventually our vet decided he probably had a ligament tear and would need an operation to repair it. I wish I had done more research or planned a little better because it has been a rough few days. An active dog who loves to run and jump, hence the knee surgery, is incredibly difficult to “contain”. Once the heavy-duty pain killers wore off, he pretty much forgot that he had an invasive procedure a few days before and jerked and twisted at every loud noise. The doorbell rang once when a delivery arrived – you would think bombs had gone off and he needed to protect us. Mr. B and I found that the best way to get him to lay around was to lay around with him. So instead of cooking and photographing new recipes for the blog, I have been watching movies and clearing out my DVR and Netflix queue. We still had to eat so I found time yesterday to make and photograph this one pot pasta recipe that I had been holding on to for a rainy day. 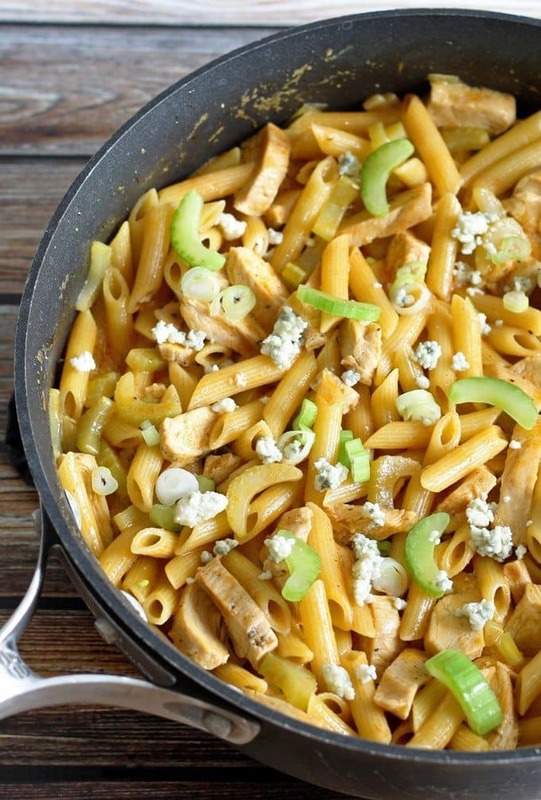 This one pot buffalo chicken pasta dinner is exactly what we needed this week. Not only is it delicious, it’s also easy to make. I had a batch of buffalo sauce in the fridge along with 4 leftover chicken breasts and both were calling my name. 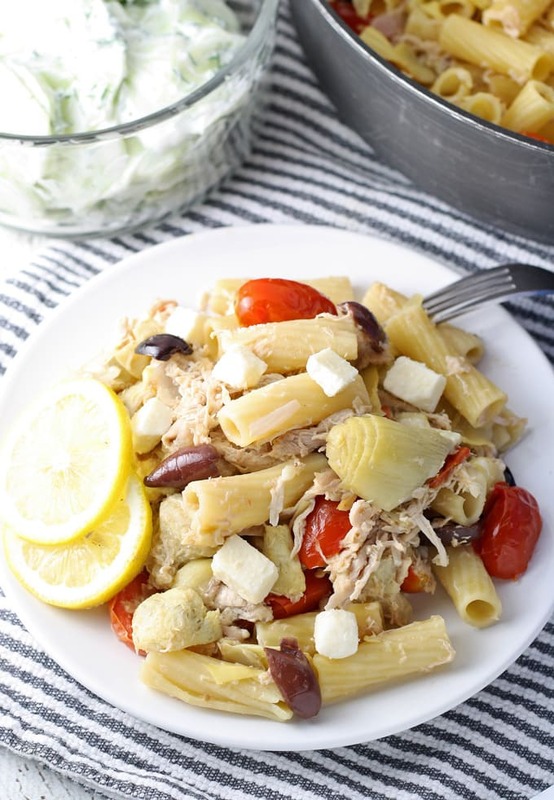 I love finding new ways to use up leftover grilled chicken – this recipe has been added permanently to my leftover chicken list. 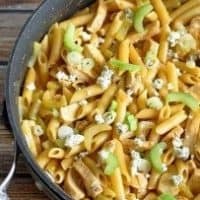 Just like with other one pot dishes I have made in the past, all of the ingredients for this one pot buffalo chicken pasta go into a large skillet at the same time. Stir occasionally and before you know it, the chicken is warm and the pasta is cooked al dente (which is synonymous to perfect here at Casa de Honey y Birch). In a pot combine all the ingredients. Stir well and bring to a boil over medium heat. Reduce heat and simmer for 15 minutes, or until the pasta is cooked but firm. Stir again. When serving, top with extra blue cheese crumbles. 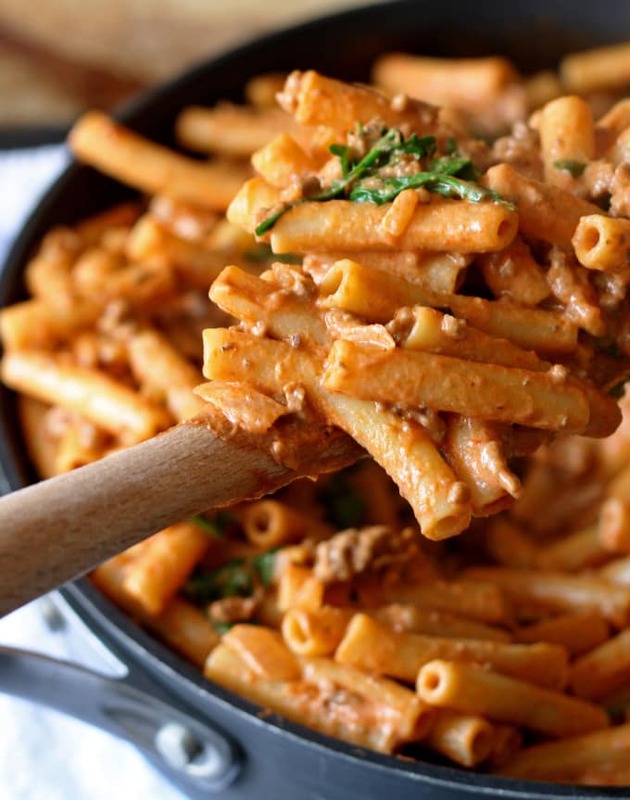 or this cheesy tomato pasta skillet! Thanks Senika – hope you like it and thank you for pinning! Thank you Kelly – buffalo sauce is a favorite in my house too! Hope the puppy is on the mend. The one-pot dish sounds tasty. Hope you saved a little chicken for Nero. Hope Nero is all better soon! Gorgeous pix of a delicious dish. Thank you Justine! He is on the mend! Sounds like a tasty, easy quick dinner! Great recipe! Saving for this weekend so I can make it for my hubby! Thanks Kristi – I hope he likes it!! Aww, hope the pup is ok. Our dog tore her acl right before she turned 1 and it killed me seeing her in pain and so incapacitated during recovery. You’d never know now though! So glad such a great and easy dinner came out of the whole thing! One pot meals are my favourite thing ever. 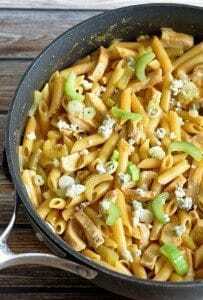 I love making them for weeknight dinners so I have to try out this recipe – a buffalo chicken pasta looks and sounds so comforting and delicious. Thank you Thalia! One pot meals are my favorite too. Oooo your poor pup! But hey it gave you an excuse to get some R&R so that’s good! Love this one pot meal! Thanks Julie!! I wish I had planned for it better but it was definitely needed. This dinner looks absolutely delicious! And healing prayers for your dog, too! I was just in need for a good one-pot recipe! Thanks for sharing it with Thursday Favorite Things! 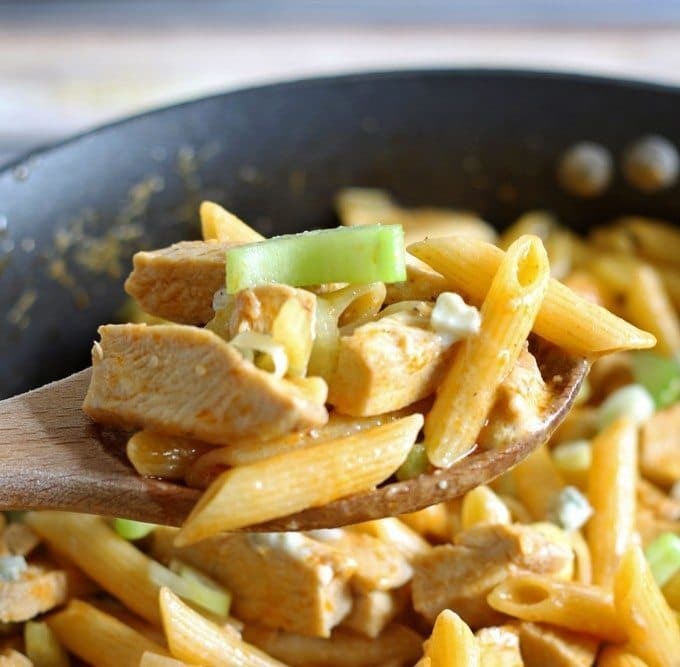 This is such a great busy weeknight dinner idea! 🙂 We love all things Buffalo Chicken in this house, so I can’t wait to try this recipe soon. 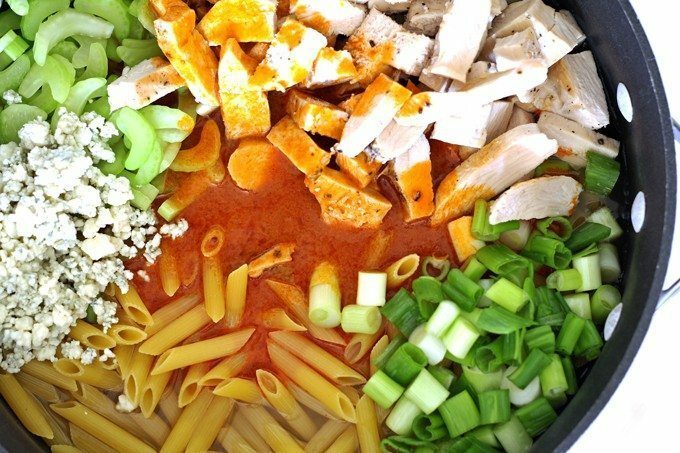 I love all things buffalo chicken, this one pot pasta sounds wonderful! Thanks for sharing at What’d You Do This Weekend?! So glad to hear that Nero is on the mend. It’s hard to sit down and just rest with a sick one but those are memories that you want and need! We certainly missed you on SM but glad you got to clear out your DVR. Watch anything good? I need new recs for shows. I love those recipes that you saved up and can throw together at the last minute. 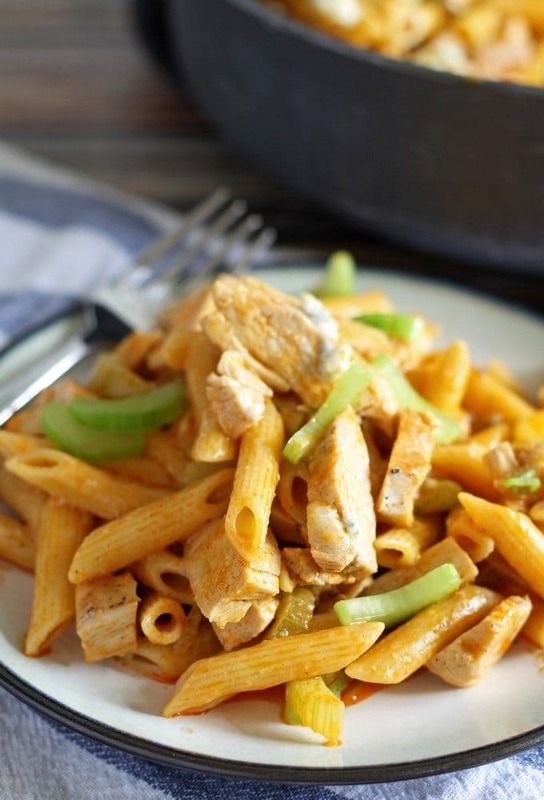 This buffalo chicken pasta is right up my alley as I always have buffalo sauce on hand! Thanks Jenny and we are sending healing vibes to Nero. Hopefully you watched some good shows that Nero liked as well.. Something with car chases and lots of mailmen? Haha, lots of mailmen, for sure! Thank you for stopping by!! 🙂 Nero and I both appreciate it ! I love quick & easy dinners and my kids love EVERYTHING pasta. This dish is a win-win! Thanks for sharing your recipe with us on Creative K Kids’ Tasty Tuesday – I look forward to seeing what you create next week! Hey, Jenny! 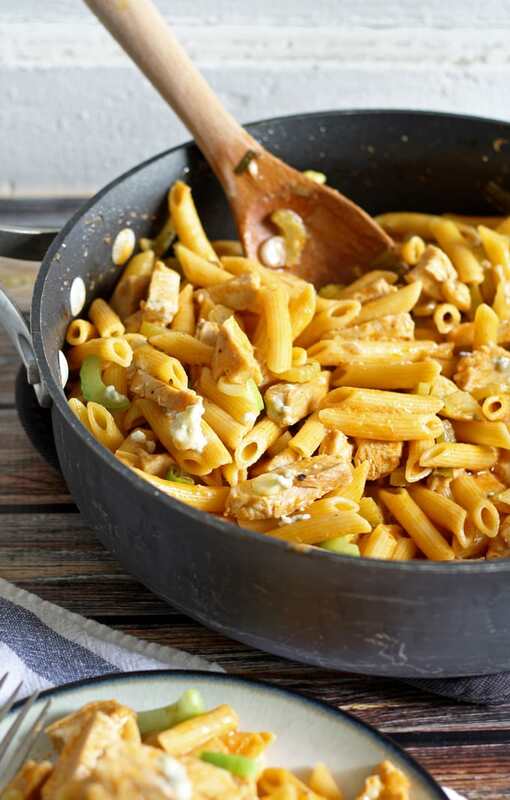 Just wanted to let you know that we loved your One Pot Buffalo Chicken Pasta so much when you shared it at the #HomeMattersParty last week, we’ve FEATURED it THIS WEEK! Hope you can check it out when you get a sec. Happy Friday!! !